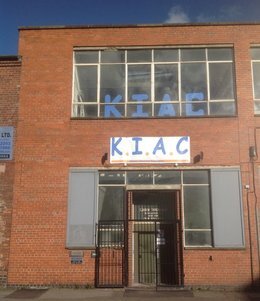 Located in Sheffield's Kelham Island Quarter, KIAC occupies several large rooms on the first floor of a former industrial building - the Lion Works. The entrance to KIAC is on Ball Street, opposite the junction with Lancaster Street. (The well-known Milestone restaurant is on the corner of Ball Street and Green Lane, just a couple of minutes from KIAC). Ball Street runs between Green Lane and Neepsend Lane, near to the Shalesmoor roundabout on Penistone Road (A61). By tram: KIAC is five minutes walk from the Shalesmoor tram stop.